Novoflex Castel-XL is more sturdy as a macro lens focusing rail than other cheaper brands. Novoflex makes a diverse range of focusing rails (racks) for macro close-up photography, for medicine, dentistry, nature, flowers, insects. Presently I am starting with the Castel-XL focusing rail system because I prefer a more rigid system. I already have two other macro focusing rails: Really Right Stuff (“Really Wobbles when used”) and a Manfrotto which is better but flexes when dialing it (but then locks down tightly). Thus I wanted to see if any of the other brands of focusing rails work better than the Really Right Stuff. So now a Novoflex CASTEL-XL profi focusing rack has arrived and as soon as I get to Guatemala I will test it (all our macro lenses are there). 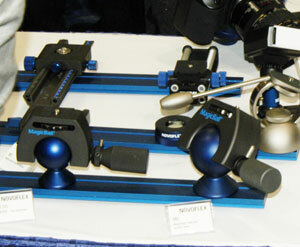 Novoflex focusing Rack Castel-mini. 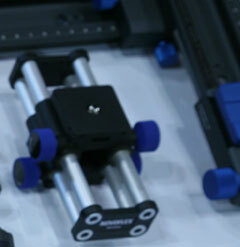 In the top of this picture we can see the Novoflex Focusing Rack L next to the Rack Castel-mini. Below, two Ball & Socket Head "MagicBall". In the 1960’s onward I used the Leica bellows for over a decade. I never had any Nikon bellows because I used exclusively Leica from 1963 and Hasselblad equipment from 1966 onward. I only moved to Nikon later, when I needed a 15mm super wide angle lens. It was more economical to buy an entire Nikon F3 camera body and a Nikon 15mm lens than it was to buy the Leica 15mm lens by itself (I already had a Leica R3, R4, and R5 camera body). 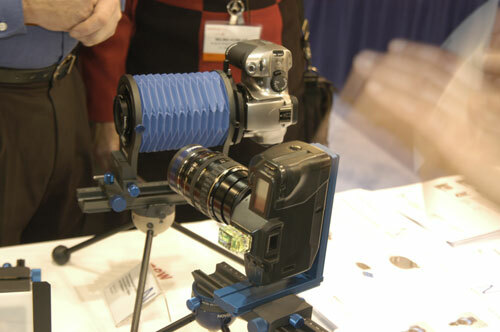 Using the Balpro 1 Novoflex bellow, combinations of different lens and camera systems is possible. But once digital cameras came out I started with Kodak digital in 1996 and moved quickly to large format a year later. Only recently did I move to medium format as well. FLAAR also has several Nikon digital SLR cameras and a Canon EOS 5D also. But never any Canon or Nikon bellows: never needed one and none of their new lenses were made specifically for a bellows anyway. I still use my Hasselblad bellows with a Zeiss macro lens, but have a separate 120mm Zeiss macro lens that does not need a bellows (but therefore can’t reach 1:1 range either). But there are many advantages to using a bellows, and plenty of old lenses are still available, including enlarging lenses for the darkrooms that not many people use any more anyway. 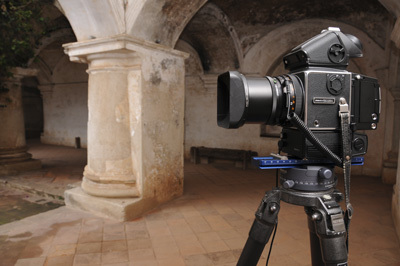 With the Novoflex VR-System PRO the camera can be rotated horizontally and vertically around the nodal point. 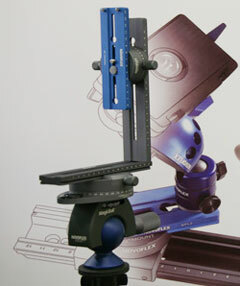 Engravings on the clamping plates make echa camera-specific position reproducible. So bellows will be a future FLAAR digital photography review topic, but for 2007-2009 we have been concentrating on macro close up with the Canon MP-E 65mm lens, Nikon 105mm and Nikon 200 tele macro. For the Canon MPE 60mm lens, this is the one that needs a focusing rail system. But if you prefer a bellows Novoflex offers the widest range of any accessory manufacturer that I know. You can obtain their catalog by asking at mail@novoflex.de. They are multi-lingual so you can write in your preferred language. When you are doing macro photography, and especially with a focusing rail, it is a waste of money to compare prices and buy a low cost system. You are better off to realize that you get what you pay for, and that a good system (that does not wobble) may not be cheap. Merely paying more by itself does not guarantee the best equipment, but comparing prices and buying the cheapest one usually means you don’t have all the features that you need. FLAAR does not receive sales commissions nor kickbacks on Novoflex equipment. We evaluate Novoflex equipment since FLAAR is a research institute dedicated to tropical flora and fauna (see www.Maya-archaeology.org). We want to know what is the best macro outfit to utilize for our photography of Mayan ethnobotany and ethnozoology in Guatemala, Belize, Honduras, and Mexico. So we test equipment in order to learn what is best for our own photography. Once we find out, we publish the results so the over 360,000 readers of this web site per year can benefit from our experience. First posted January 19, 2009.